Traverse the beating heart of France! Begin in the capital city and enjoy the Latin Quarter, Luxembourg Gardens, the Louvre Museum, Champs-Elysees and the Eiffel Tower. Take a day trip to the magnificent Versailles, and spend a day in the Champagne region tasting wine and discovering Reims. As a highlight tour French chateaus, including Chateau de Chenonceau and Chateau de Chambord. As they say, Paris is always a good idea! Bonjour and welcome to the most romantic city in the world and the charming capital of France - Paris! Upon arrival, your driver meets you at the arrivals hall of the airport holding a sign with your name on it and takes you to your centrally located hotel for check-in. After breakfast your guide meets you in the hotel lobby and takes you on a 6-hour walking tour of the two famous districts of Paris: Latin Quarter (5th) and Marais (4th). Your tour of the fabulous capital of France begins with the UNESCO Site Heritage - Banks of Seine river. Continue to the Latin quarter and taste a Bohemian charm of the medieval narrow streets and stone-paved alleyways. Reach the Ile de la Cite where you see the world’s most famous gothic cathedral - Notre Dame. Walk through the Ile Saint Louis and get closer to more sights: Hôtel de Ville (city hall), Fountain of the Innocents and Palais Royal. You then proceed with the tour of the Louvre Museum, one of the world’s largest museums, taking advantage of your skip-the-line tickets. You see the crème de la crème collections and the most celebrated works of art, ancient artifacts, Greek sculptures, including the famous Venus di Milo, Winged Victory, and masterpieces of Michelangelo, Eugène Delacroix, Paolo Veronese and the world’s most enigmatic Portrait of Mona Lisa by Leonardo da Vinci. Following breakfast your guide meets you in the hotel lobby and takes you on a 5-hour walking tour of the Champs-Elysees (8th) and Eiffel Tower (7th) districts. Today you start with outstanding Places Vendome and Concorde and proceed to the Tuileries Gardens - the oldest park in the city. You get to see one of the most recognizable landmarks with its magnificent glass-domed roof - Grand Palais and smaller but similar Petit Palais, built for the Universal Exhibition in 1900. Step on the most ornate and extravagant bridge in the city - Pont Alexandre III and continue to the Place de Trocadero which is the vantage point of the Eiffel Tower*. 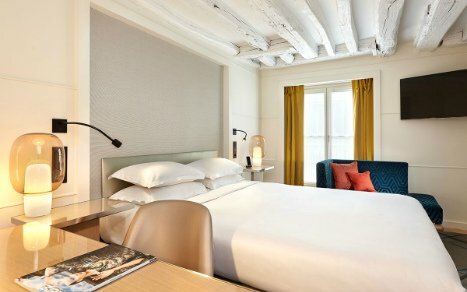 After the tour you may return to the hotel or take an optional boat cruise along the Seine river. Start the cruise in the very heart of Paris and discover the most wonderful city gems including Louvre Museum, Cathedral Notre-Dame, the Eiffel Tower and other beautiful monuments from an absolutely different perspective. Note: Tickets to the Eiffel Tower are not included in the city tour due to limited availability. Please, ask your travel specialist about available tickets for your tour date if you would like to include it. Following breakfast at your hotel, meet your guide in the lobby and have a day tour to the famous residence of French kings. Together with your experienced guide you take a short train ride to taste what it means to be a local, and appear in the heart of Versailles in just 1 hour. You see the Palace of Versailles and admire its grandiose opulence from the inside. You get to walk through its well-known Hall of Mirrors where the Treaty of Versailles was signed and see the actual rooms of the most extravagant king of France, Louis the XIV. You also discover the world famous Le Notre gardens, see the Grand Trianon (exterior) and enjoy an inside visit to Petit Trianon - Marie-Antoinette’s estate. After the tour, you are taken back to your hotel and have the day free. In the early morning you are transferred to the train station where you board a train to the Loire Valley town of Amboise (1st class train tickets included). Upon arrival in about two hours, your small group tour* to Loire Valley starts. Your first stop today is the brilliant Chateau de Chenonceau, which you get to explore taking advantage of your skip-the-line entrance. You have a guided tour of Chateau de Chenonceau, often described as ‘the ladies chateau’. It sits in a beautiful setting literally on the Cher River, surrounded by gardens on the adjacent terraces and river banks. Then continue to troglodyte cellar caves located along the Loire River's central area. You are treated to lunch in one of the caves with a wine tasting. Another place you visit today is the outstanding Chateau de Chambord, one of the most recognizable chateaux in the world due to its very distinctive French Renaissance architecture. Together with your guide you explore the castle and enjoy your skip-the-line entrance. After the tour you are taken to the Amboise train station for your return to Paris (1st class train tickets included). Upon arrival your driver takes you to your hotel. *Group size is up to 8 people and is available from March to mid-December. Refer to your travel specialist to upgrade this tour to private. Breakfast, lunch, and drinks are included. Today you have the day free to continue enjoying Paris on your own or join one of our carefully planned optional tours. Set off on an outstanding full day tour to Normandy. Together with your guide you get to visit the sites of the D-day, one of the most important events of the World War II. Enjoy a 2-hour walking tour of the famous Picasso Museum in Paris, dedicated to the work of the Spanish artist Pablo Picasso. Treat yourself to a tasty 2-hour Chocolate Walk tour around Paris's Rue St. Honore. Learn about the history of chocolate and taste chocolate products. After breakfast your driver meets you at the hotel lobby and takes you to the train station for your short train ride to Reims (1st class train tickets included). Upon arrival in about 1 hour, you are met by your guide-driver and set of on a sightseeing small group tour* of main attractions of the Champagne region that is bubbling over with heritage sites and fine Champagne. During the tour you get to visit two famous Champagne houses as well as one smaller local producer to have an excellent overview of the process of making world-class Champagne, its history and have a Champagne tasting. Then continue to Reims to see its main sight from inside and outside, the Cathedrale Notre-Dame de Reims. This Gothic cathedral was the site of 25 coronations of the kings of France, from Louis VIII in 1223 to Charles X in 1825. After the tour, you are taken back to the train station for your train back to Paris (1st class train tickets included). Upon arrival your driver takes you to your hotel. *Group size is up to 8 people. Refer to your travel specialist to upgrade this tour to private. This is the last day of your tour of France. Your driver meets you at your accommodation and takes you to the airport for your flight back home. We wish you a safe flight and hope to work on your future vacations! You can expect to find some shops, restaurants, and museums closed for lunch between 12 p.m. and 2 p.m.